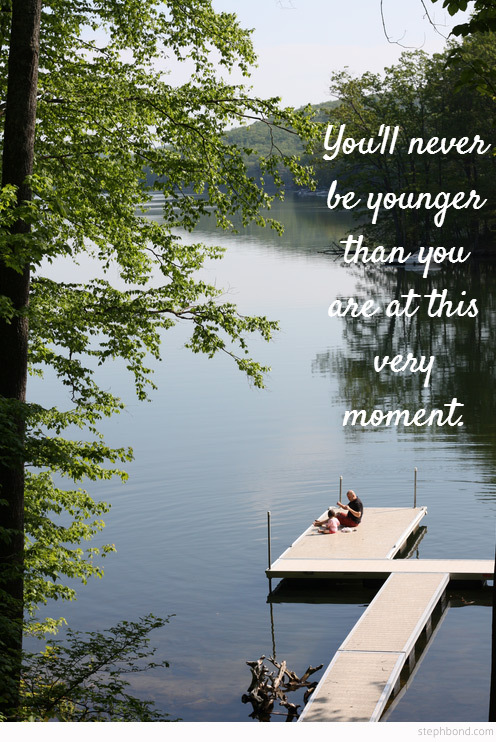 "You'll never be younger than you are at this very moment." This is a saying that I think about all the time. It's actually a truncated version - I took off the first part: "Enjoy your youth."! - but it reminds me to act now, stop procrastinating, and live in the moment. It's kind of powerful to know that at this moment you are the youngest you will ever be, don't you think? To create this image I used a brand new website called Canva.com. The team behind Canva is based here in Sydney and are making waves with their free site, which enables you to create .jpg or .pdf images without owning any software. You can use one of the large number of Canva templates or nominate your own image size. Next, upload your photos or images to use on the site, or choose from Canva's free backgrounds and text. You can even access a whole collection of low-cost stock photography right there on the site. Overlay your copy on top (there are lots of different fonts to choose from) and voila! - your file is ready as a .jpg or .pdf download. Brilliant - I think Canva will be so incredibly useful for all of us to be able to create professional-looking graphics, invitations, business cards, Facebook covers, blog banners, photo collages (the list goes on!) with little-to-no-skill. Head over to Canva.com to trial the Beta, and support our local design talent and entrepreneurs doing amazing things in the online world.